There are cat calendars—and there's the cat calendar. 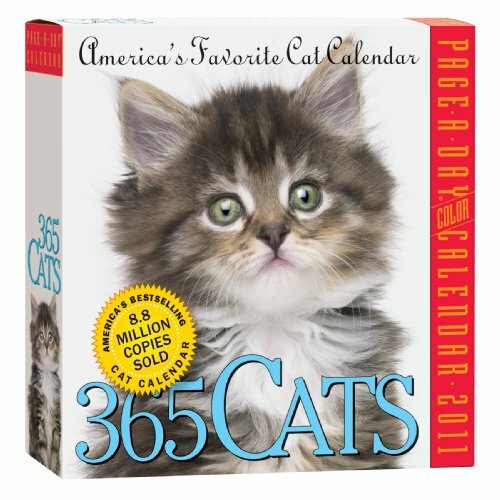 Year after year, 365 Cats is the numero uno in over-the-top feline attitude and adorability. On every page you'll find one (or more) of the hundreds of lovable winners of the 2010 Cat Calendar Contest. Meet fluffy Himalayans, Russian Blues, and Havana Browns. Wary Rexes and sleek Siamese. Smoky shorthairs, striped tigers, colorful calicos, and piles of supersoft kittens—impossible to resist. They're slinking through flower beds, lapping milk, hanging out in baskets, snoozing in sunbeams, chasing butterflies, and just acting like their goofy, inscrutable, endearing selves. Accompanying the fullcolor photos are quotes, breed facts, health and care tips, and lore.